Tennis elbow is a condition causing pain around the outside of your elbow and golfer's elbow is pain around the inside of your elbow. In both conditions the pain can move down to your forearm. Certain movements, such as gripping or twisting, can make it worse. Some people have constant pain that causes disability and disrupts their sleep. 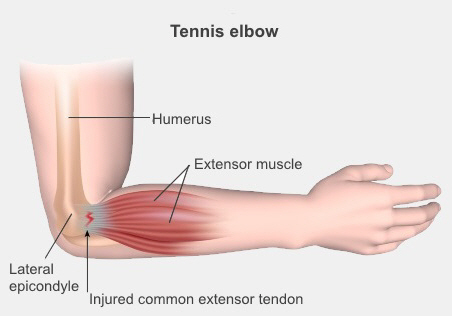 Tennis elbow is common, affecting 1 to 3% of working-age people. Golfer's elbow is less common, affecting less than 1%. regularly lift weights of more than 20 kg. The muscles on the outside of your forearm, which pull your hand back, are attached by a tendon to the outer part of your elbow (this is called your lateral epicondyle). The muscles that flex your hand (bend it forward) are attached by a tendon to the inside of your elbow (called your medial epicondyle). So the medical name for tennis elbow is lateral epicondylitis (ep-ee-con-di-lie-tis), and the medical name for golfer's elbow is medial epicondylitis. We think that small tears where the muscle and the tendon join cause tennis and golfer's elbow. These tears make the tendon swell and thicken, and this causes pain. The thickened tissue is more fragile, so continuing to do the things that has caused the damage may make it worse.